Looking at the phones launched by Nokia this year, there is no doubt that the company is very serious about its smartphone business. The Nokia 6 2018 and Nokia 7 Plus could be among the best selling mid-rangers of this year if the company prices them right for the different markets. We have been getting the rumors about Nokia 9 from last year, and today, we might have got the biggest leak of the phone. The official press render has leaked out along with the major specifications which suggest that Nokia 9 is going to be a beast, not just regarding the performance but regarding the camera. Just like the latest Huawei P20 Pro, the phone is coming with a triple rear camera setup. As seen in the image above, there is a glass and metal design, just like the Nokia 8 Sirocco. 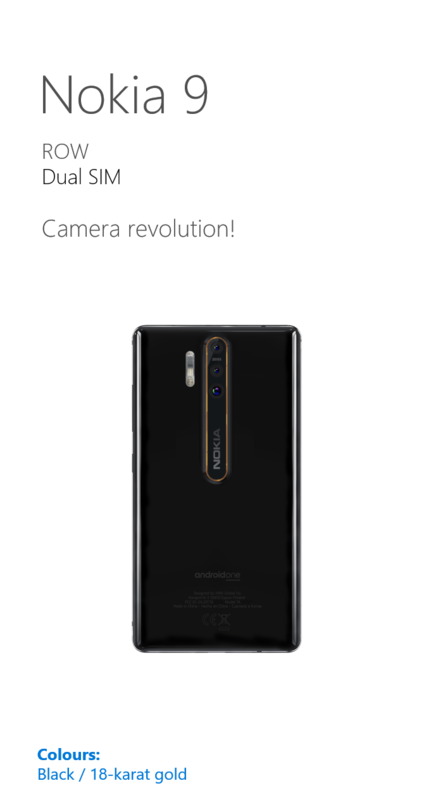 The camera setup on the rear is similar to that of the Nokia 6 2018’s camera setup except for the fact that it has not one or two but three camera sensors. And just like all the recent Nokia phones, the camera sensors are ZEISS branded. 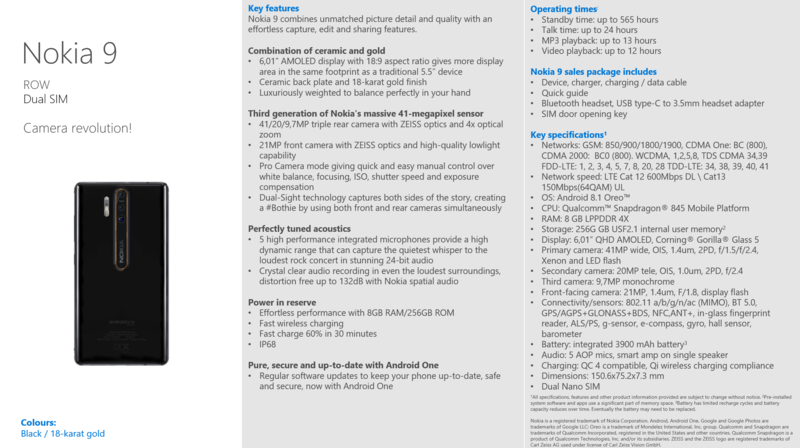 Another image shows some major specifications of the phone. As per the image above, the Nokia 9 has a 6.01-inch AMOLED display with 18:9 aspect ratio and Gorilla Glass 5. The phone has ceramic back with a gold accent. If these are the official details of the phone, then the camera department seems pretty solid. There is a triple camera setup that includes 41MP+20MP+9.7MP sensors with ZEISS optics. There is also 4X optical zoom. Again, impressive! On the front, the Nokia 9 has a 21MP camera with ZEISS optics. There is PRO camera mode, Bothie Mode and more. There are five microphones to provide a high dynamic range, and the device has Nokia Spatial Audio. Snapdragon 845 processor powers the phone and there is 8GB RAM along with 256GB ROM. The battery is 3,900mAh, and the phone supports Fast Charge. The battery can charge up to 60% in 30 minutes. The Nokia 9 is IP68 rated too. Due to the ceramic back, the Nokia 9 supports Qi Wireless charging. There is no headphone jack, and so, the phone comes with only the USB Type-C port. Lastly, Android 8.1 Oreo runs out of the box, and the device is Android One branded, just like the latest Nokia phones. The images do look somewhat official, but these can be Photoshopped images so, we still have to confirm it from the trusted sources. Till then, consider these with a pinch of salt.